IMAC is based on the interaction between molecules in solution and metal ions immobilized on a solid support. The molecules are separated according to their affinity for the chelated metal ions, which depends on the coordination between the chelated metal ion and electron donorgroups from the ligand. The ligands are assumed to bind to the metal through ligand exchange. Two characteristics of the metal–ligand bond can be used for the successful separation of different ligands. Ion exchange is probably the most frequently used chromatographic technique for the separation and purification of proteins, polypeptides, nucleic acids, polynucleotides, and other charged biomolecules . The reasons for the success of ion exchange are its widespread applicability, its high resolving power, its high capacity, and the simplicity and controllability of the method. Affinity chromatography is a method of separating biochemical mixtures based on a highly specific interaction such as that between antigen and antibody, enzyme and substrate, or receptor and ligand. 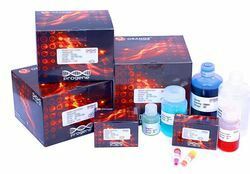 Affinity chromatography is a particularly powerful procedure, which can be used to purify Immunoglobulin, sub populations of IgG, or the antigen binding fraction of IgG present in serum/ascitic fluid/hybridoma culture supernatent. This technique requires the production of the solid matrix to which a ligand having either affinity for the revelent IgG or Vice Versa has been bound. Column chromatography is one of the most useful methods for the separation and purification of both solids and liquids. This is a solid - liquid technique in which the stationary phase is a solid & mobile phase is a liquid. The principle of column chromatography is based on differential adsorption of substance by the adsorbent. Ion Exchange chromatography is a powerful procedure, which can be used to purify IgG(antibody), sub populations of IgG, or the antigen binding fraction of IgG present in serum/ascitic fluid/hybridoma culture supernatent. This technique requires the production of the solid matrix (DEAE Cellulose)to which a ligand having either affinity for the revelent IgG or Vice Versa has been bound. Gel filtration chromatography (sometimes referred to as molecular sieve chromatography) is a method that separates molecules according to their size and shape. The separation of the components in the sample mixture, with some exceptions, correlates with their molecular weights. In these cases, gel filtration can be used as an analytical method to determine the molecular weight of an uncharacterized molecule. Gel filtration is also an important preparative technique since it is often a chromatographic step in the purification of proteins, polysaccharides and nucleic acids. Affinity chromatography is a particularly powerful procedure, which can be used to purify Immunoglobulin, sub populations of Ig, or the antigen binding fraction of Ig present in serum/ascitic fluid/hybridoma culture supernatent. This technique requires the production of the solid matrix to which a ligand having either affinity for the revelent Immunoglobulin has been bound. Paper Chromatography is a separation technique that is used to separate and identify the components of a mixture . Paper chromatography is used to identify colouring agents. Looking for BIO TECH Teaching kit - Chromatography Techniques ?